The VW Cabrio has a well earned reputation for being a hairdressers car and is not normally associated with performance engine swaps. The factory Cabrio SOHC 1.8 engine only put down 94 hp so there are no tears lost at its disappearance here. Somehow today's car ended up with a 16V engine, but this large detail is not revealed by the seller in the listing. It is beyond rare to find a Craiglist's seller that downplays or does not even mention any modifications made to a car. Find this 1993 Volkswagen Cabrio for sale in CT for $1,900 via Fairfield County Craigslist. 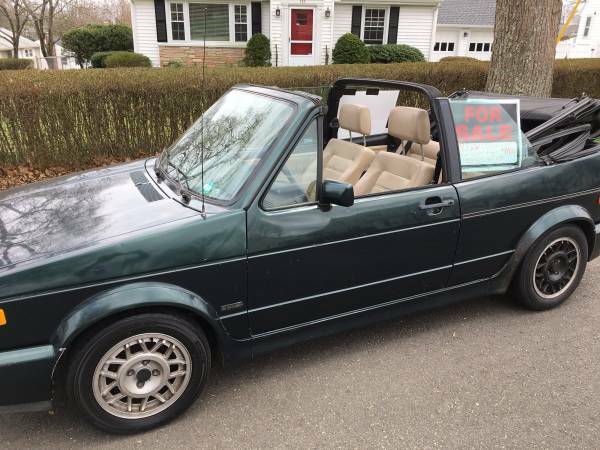 The ad for the Cabrio could be written on a napkin. The seller mentions an engine rebuild that happened 50,000 miles ago and to call for more details. No mention is made of the 16V engine, the MK1 GTI snow flake wheels, or any other information on the car. 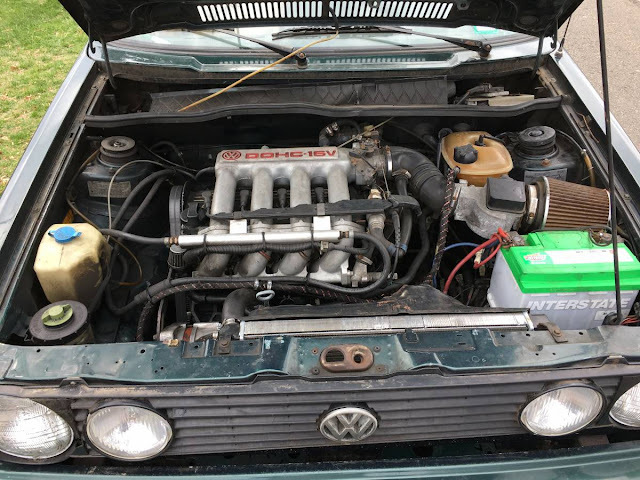 The VW 1.8 16V engine was good for at least 123 hp in the US. These engines are particularly robust and take very well turbo charging. Here is a massive 76 page long thread on VW Vortex about turbo charging the 16v engine: VW 16VT engine info. Cory is working on swapping the headliner in his 1995 C36 AMG this weekend. You could get snowflakes on cabriolets as well. The cabriolet snowflakes were all silver vs. GTI snowflakes which had gunmetal in between the spokes. The snowflakes were an option in 1993? I don't think they were, teardrops and castellets were common from the factory iirc. I don't know when snowflakes were available on Cabs, but according to Vortex the silver ones were Cab. 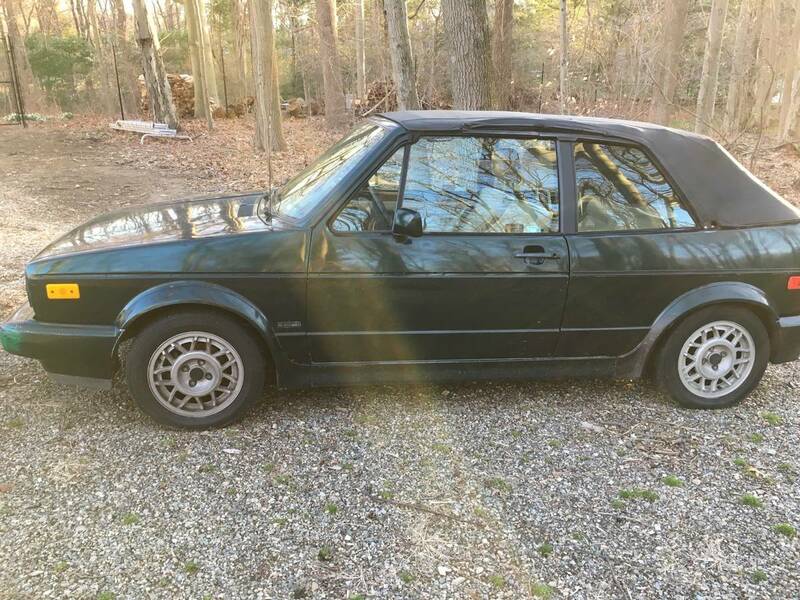 When I had my Mk1 GTI, I got two silver ones and masked & painted the centers with some gunmetal wheel paint. Who knows the origin of the wheels on this mongrel. I used to own this very year and color cabriolet. It looks good with snowflakes, I had silver BBS mesh one pieces on mine. The 16v would be a HUGE improvement. If my stupid foot wasn't broken I would have kept it but the clutch was pretty stiff and my left foot is full of bone chips. I also always wanted to do a motor swap on one of these, the 1.8T fits in the factory mounts.